Like bent chairs, twisted limbs, and shattered hopes and dreams, all wrestle-utions are made to be broken. 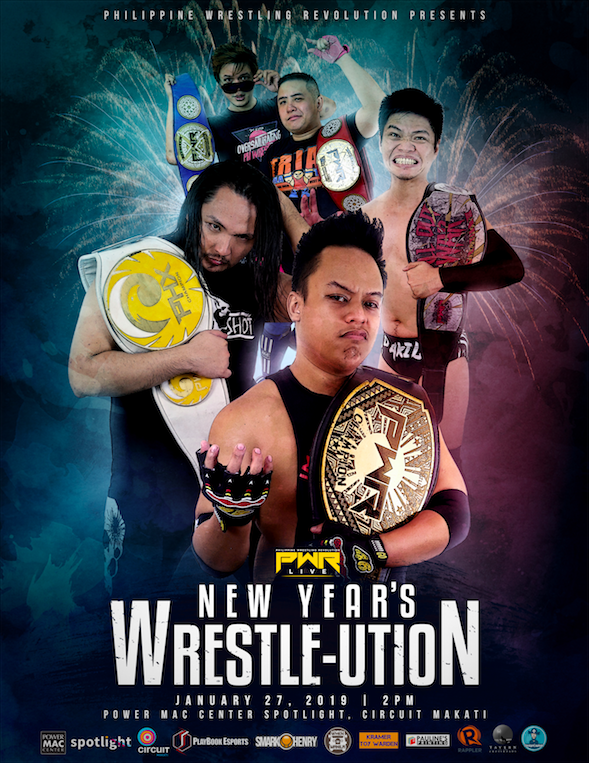 Ring in the new year with PWR on January 27, 2019, 2 PM, at the Power Mac Center Spotlight for their first show of 2019 – PWR Live: New Year’s Wrestle-ution! Despite Rederick “Mainstream” Mahaba’s sudden departure from Philippine Wrestling Revolution, the PWR Tag Team Championship match that he and his former partner Ralph Imabayashi had requested at PWR Vendetta will still be pushing through! However, the question remains, who will be the PWR Champion’s partner going up against the tried and tested PWR Tag Team Champion duo of the Naughty Boys of Philippine Wrestling – Evan Carleaux & Trian Dela Torre? Will Ralph Imabayashi find a partner that will help him become a double champion in PWR or will the Naughty Boys continue their mission to defend the division? In a surprising turn of events, it seems that newly crowned Philippine Excellence Champion John Sebastian has granted the former PHX champion, Jake De Leon, his one-on-one rematch for the title amidst clamor from other competitors for a shot at the gold. No matter the circumstances, Mr. Philippine Wrestling will be looking to exact some revenge on John Sebastian and win back the belt he feels should rightfully be around his waist. Will Mr. Philippine Wrestling be able to reclaim the title he held dearly or will the Wrestling Lord and Savior knock off the Senyorito? Dax Xaviera was finally able to claim his beloved “AOWrora” (a name he calls the ALL OUT WAR Championship belt) at PWR Vendetta at the expense of the former ALL OUT WAR Champion Alexander Belmonte III. However, an enraged AB3 would attack Dax after the event and would waste no time demanding his rematch for the title at the next PWR event. This time, however, the title will be defended in the match that brought about its infamy: ALL OUT WAR. Will the Warlord reclaim the championship what was once his or will the “Diyos ng Digmaan” hold on to his dear “AOWRora”? Mike Madrigal and QUATRO are both highly talented competitors that have proved their mettle in the past. However, both wrestlers have failed to capture the PWR Championship on separate occasions. Now both of their paths will finally be crossing at PWR Live and this match will be sure to keep everyone on the edge of their seats. Will the Lightbringer continue to shine through or will King Kupal finally turn off Quatro’s lights? Both Crystal and Chris Panzer have been vying for the Philippine Excellence championship for the latter part of 2018. However, both competitors came up short in the historic 6-Way Survival match at PWR Vendetta and both of them seems to be blaming each other for their failure to do so. That’s why in this PWR Live event, Panzer and Crystal will be working out their issues in a one-on-one match against each other. Will Panzer be able to extinguish the fiery Crystal or will the Queen of Philippine Wrestling be able to cut off the wings of the Motor City Angel? Ken Warren vs. Jan Evander, Pw.D. Ken Warren has been on a crusade to finally get his one-on-one rematch for the Philippine Excellence championship but it seems that there are just too many obstacles in his path. The next obstacle he will be facing is a highly intelligent and incredibly driven Dr. of Professional Wrestling, Jan Evander. Will the leader of The Endgame be able to finally make his mark in PWR at the expense of The Social Media Sinister? Will Ken Warren ever get his one-on-one rematch for the PHX Championship? PWR Tag Team Tournament Announced! A tournament to decide the new #1 contender for the PWR Tag Team Championships is upon us at the start of 2019! Which teams will take part? Who will come out on top? Stay tuned as PWR will be announcing the matches and the participants soon! These are the exciting and electrifying matchups that you can expect at PWR Live: New Year’s Wrestle-ution but there’s also much more to be seen. So come join us on January 27, 2019, 2 PM, at the Power Mac Center Spotlight for PWR’s first show of 2019! Get your advance and discounted tickets now. To order, send us a Facebook message or e-mail us at pwr.tickets@­gmail.com. Tickets will also be available on ticket2me.net and our ticket partners Kramer Toy Warden, Tavern at the Crossroads in Cubao Expo, and Pauline’s Printing very soon. ADHOC Ascendancy : When College-Aged Stud’s Party in Dress, High-Heels, Beats and the Crowd! Bombay Bicycle Club Live in Manila on July 23, 2014!